You and your family will travel in style in the 2016 Sienna, Toyota's original Swagger Wagon. There is something about this versatile minivan that makes driving fun again. For the first time, this year's Sienna received the Top Safety Pick award from the Insurance Institute for Highway Safety (IIHS). That confirms the new Toyota Sienna is the perfect family wagon for today's lifestyle. Come to Charlottetown Toyota at 1 Superior Crescent Charlottetown, PO BOX 730 in Charlottetown, PE for a first-hand look at the 2016 Sienna. Be forewarned that you may not recognize the new Sienna with all its recent restyling. We have a large selection of them in stock, in all the most popular colors and trim packages, so hurry in for a memorable test drive. All our friends and neighbors in Charlottetown, Stratford, Mt. Herbert, Cornwall, Marshfield, Brackley, and Milton Station, PE are invited, as well. Remember to bring your whole family, and your selfie stick, because family outings have never been more enjoyable. Toyota has put 60 years of research and development into the 2016 Sienna's all-encompassing safety features. You get eight smart airbags that deploy in stages, including (as standard equipment) driver and front passenger seat-mounted side airbags, a driver knee airbag, a front passenger seat-cushion airbag, and Roll-sensing Side Curtain Airbags for all rows. New for 2016 is the LATCH system for child safety seats that allows you to secure them to the minivan with one-click convenience. 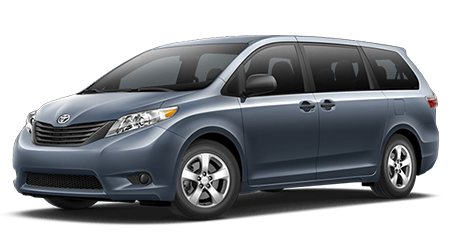 By the way, the 2016 Toyota Sienna is the only minivan that offers an all-wheel-drive option, so you and your loved ones will never get stuck. When you see the 2016 Sienna coming down the street, you know it means business. Toyota's flagship family van has a whole new look for 2016, and everyone likes what they see: a restyled grille, futuristic contours and LED projector beam headlights. The Sienna is the minivan of tomorrow, with high-tech amenities and room to spare. Even the lowly van doors have been elevated to modern marvels with a unique sliding mechanism that can be opened by the overhead console switches, interior pillar controls, or the door handles. For the ultimate in security and convenience, the new Sienna offers a Smart Key FOB that lets you unlock the doors just by standing nearby with the keys in your pocket or purse. It's easy to get into the 2016 Toyota Sienna! You will appreciate the nice selection of 2016 Toyota Siennas currently on display at Charlottetown Toyota. Come in early for the best choice of in-stock trim packages and Sienna accessories. Also, remember to bring your Hollywood-style sunglasses for the test drive - if you're going to drive a stylish Swagger Wagon with a plush limousine-like interior, you want to look the part. The original appeal of the minivan was to remind us of exciting excursions in a limousine-quality wagon - shuttling to the airport for a flight, or taking a tour-group trip to the museum across town. Come to Charlottetown Toyota at 1 Superior Crescent Charlottetown, PO BOX 730 in Charlottetown,PE, also serving Charlottetown, Stratford, Mt. Herbert, Cornwall, Marshfield, Brackley, and Milton Station. You will see that the 2016 Toyota Sienna has not lost its appeal.